My name is Shirley Usher and I am the pack leader of the most loveable unique little dogs ever created. I fell in love with my first chihuahua when I was a 10 year old child in 1954. Tiny, a gift from my grandfather, was my constant companion and she followed me everywhere. We were devoted to each other for many years until her death. Fate again brought chihuahuas into my life when I adopted a stray long haired Black chihuahua in 1966. Trixie was a loveable companion to my small children. Then again a chihuahua entered my life when, my son had me look after Scooter his black chihuahua while at the hospital with his wife waiting the birth of my grandson. Scooter is still with me 17 years later. Another little stray female Tina arrived at my door and she lived to be 22 years old. That was it I was smitten. After early retirement at age 50, I was breeding parrots full time: www.sunsetaviaries.ca and my customers were always admiring my chihuahuas and asking if I had any pups for sale. So I gave into my passion for these little gems and bought a few more to share my home. All of my chihuahuas except two have been re-homed due to changes in peoples lives. Many from their history, I know that I am their 3 or 4 home and they are not yet two years old. I will be their forever home while I am still alive and well. That is why I am so very careful that my customers are well informed about the care these little creatures require before I agree to sell them a puppy. I will always take back a dog if they can no longer keep it. 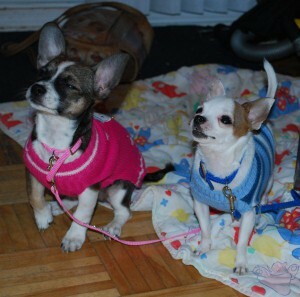 My chihuahua puppies for sale in Ontario are pure bred and raised to be loveable companions not show dogs. Some of my chihuahuas are registered but I do not register the pups as I am trying to keep these little cuties affordable for most families. My chihuahuas are raised in my home with me. They are not kennel raised. All of my puppies are hand held daily from birth and are healthy, happy and well socialized. They are raised on a nice sandy beach on the shore of the Ottawa River. They have a little doggie door that they use to go outdoors and run in a large fenced grassy yard weather permitting. They are also trained to use pee pads and newspaper during the cold weather when we have so much ice and snow and below zero temperatures. They are vaccinated and health checked by a vet that comes to my home. They are fed a good commercial dog food and they also get one home cooked meal of chicken and rice with vegetables in it every day. They get lots of cuddle time and seem to prefer to sit on my shoulder to be closer to my face to cuddle, rather then just lie on my lap. They also take turns sleeping in my bed with me. They are like little shadows they follow me room to room always keeping me in sight. They are beyond devoted. They are super smart and love to play fetch with a ball and wrestle with stuffed toys. Most of my chihuahuas are the small appleheaded chihuahuas variety weighing from 2 to 5 lbs. Because of their size I do not rush them out the door. I keep the smaller puppies until they are at least 10 to 12 weeks old and at least 2 pounds before I let them go to their new homes. Males and females make equally nice pets. If males are neutered before they learn to lift their legs at approx. 6 months of age they will continue to squat like a female for the rest of their lives. Chihuahuas are not problem dogs. Due to their size they cannot jump onto furniture or get into things on tables or counters. they are reasonably quiet and a great for apartments. They do not need to be walked daily they can get their exercise just playing indoors. This makes them an ideal pet for the elderly and those people with mobility problems. they have a longer life span then most bigger dogs making them a better value for the dollar. They can live to be 20 or longer. They are good with children but children must be supervised so that the smaller dogs are not picked up and dropped causing them injuries. When my puppies leave I send a gift bag home with them. They will have an information book, food samples, medical records, toys etc. I will always be available to answer any questions. My babies are my passion and I only want the very best for them for the rest of their lives. Thank you for stopping by and take time to visit the rest of the site and enjoy the pictures and information. Feel free to contact me for further information. I do ship to most places that have major airports. Sunsets Chihuahuas offers in home chihuahuas boarding in Ontario, home cooked meals, hands on loving and cuddling and the opportunity to share my bed. No kennels or crates or cages needed. Large fenced yard and friends to play with. A few weeks or week-end with Grandma Shirley, the time will fly by for your pet and it will not be lonely. Sunsets Chihuahuas is a chihuahua breeder business licensed by Mississippi Mills. Sunsets Chihuahuas enjoys a good rapport with customers in the city of Ottawa. I am happy to be an Ontario Chihuahua Breeder! !